Spring is finally here and Easter is right around the corner. April also means the rainy season so why not have a fun idea for the kids to do when they can't go outside! This makes it the perfect time for Caterpillar Cupakes! The kids will have a ball making their own little creatures! Hubby and I made these, and we had so much fun! Mix your cake mix according to its directions and make it into cupcakes. Allow to cool. Dip approx. 1-2 tsp. of white icing into a small bowl and set aside. Add a few drops of green food coloring to the remainder of the white frosting and stir. Repeat until you get the green color that you're after. I chose a pastel green, so it didn't take very much. 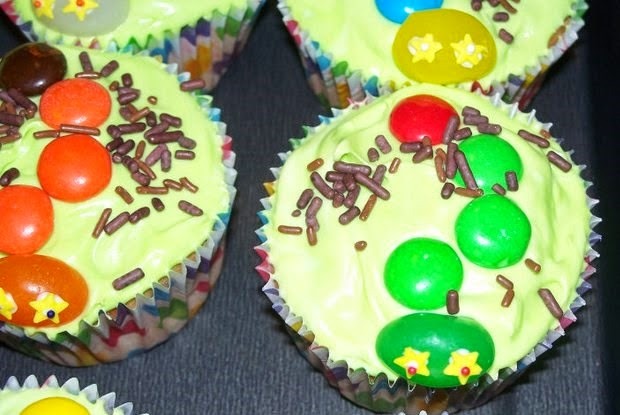 Frost your cooled cupcakes with the green frosting. Now here comes the fun part! 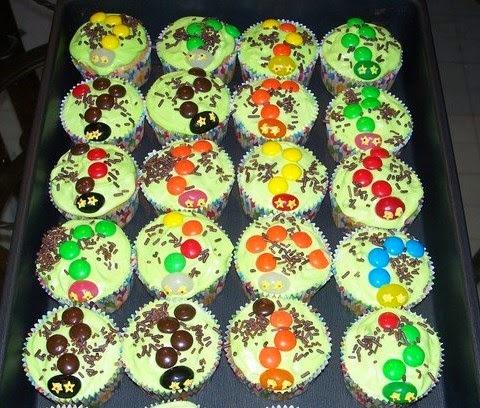 Put 4 M&M's into a curvy shape on top of the cupcakes.. any colors.. mix and match! These form the body. To make the head, dip your toothpick into the white icing from the bowl you set aside... this is no longer frosting.. we are using it as glue! Put 2 small drops onto your jellybean and place 2 of the star sprinkles. put 2 even smaller drops of icing onto the stars and, using your tweezers, place a non-peril sprinkle. And Voila! You have a caterpillar head =) Place the head with the bodies and repeat until all cupcakes are done. When finished, sprinkle with chocolate sprinkles.. this is your "dirt". They turn out so cute and kids love them! Such a cool idea! And pretty too! !